Oil pipelines are susceptible to various types of corrosion which costs the oil industry billions of dollars annually. The scope of this project is to investigate corrosion mechanisms and introduce a solution to reduce corrosion and problems caused by it. Most of pipelines are made of carbon steel and lack a coating inside pipeline. Presence of water and microorganisms provide a corrosive environment inside pipeline. A prevalent and detrimental type of corrosion is Microbial Induced Corrosion (MIC) that is caused by the bacteria in seawater. Bacteria form biofilms inside pipeline which is very hard to remove since antibiotics cannot penetrate into them. Inhibitors are often injected into pipeline stream to prevent MIC, however they are not always effective. Polymer coatings are a viable solution for decreasing microbial colonizing inside pipeline. However uniform application of the coating is an important parameter that should be taken into account. Another common corrosion is erosion corrosion which is induced by flow. A comprehensive model that takes into account effect of temperature and velocity can help understanding the mechanism and improving pipeline system. High performance polymer fibers are frequently used in personnel armor applications due to their high tensile strength-to-weight ratios. Dimensional analysis has demonstrated that ultra high molecular weight polyethylene (UHMWPE) fabrics underperformed compared to theoretical models of this system. One possible explanation is the low melting temperature of UHMWPE relative to other polymer fibers used in ballistic applications. 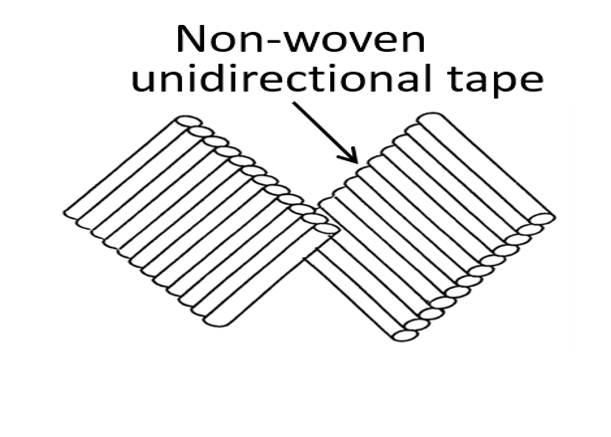 Under tension, two mechanisms compete to relieve the strain energy within the UHMWPE fibers. 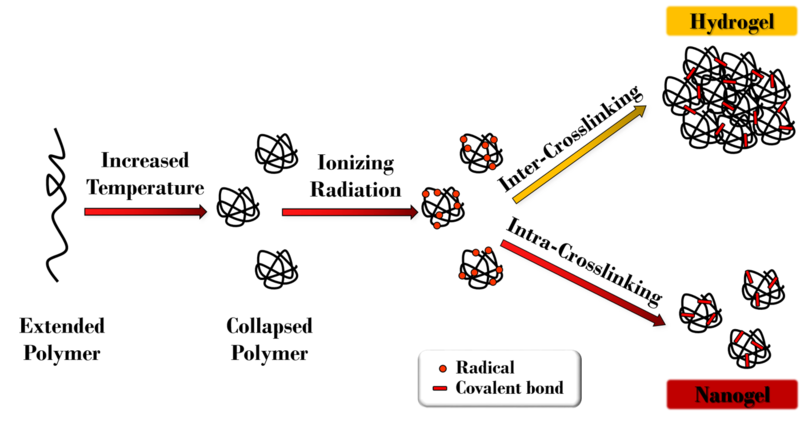 Chain scission, or the breaking of the C-C bond, is dominant at low temperatures and high strain rates. Chain slippage, or the sliding of chains past one another, is dominant at high temperatures and low strain rates. 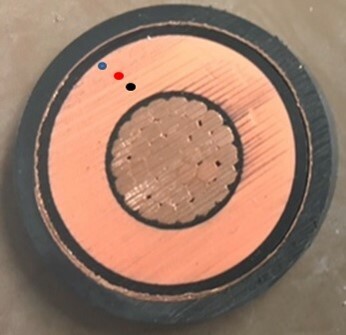 During ballistic impact, the contacted region is subjected to high temperatures and high strain rates. The dominant mechanism under these conditions is not well understood, and it is the purpose of this study to investigate this type of event. In commercial pressurized water reactors, boric acid is added to the coolant to act as a neutron adsorber. The interaction between the neutrons and the boron in the system however lead to significant amounts of alpha radiation as a result of the 10B(n,α)7Li reaction. This high LET radiation has a significant impact on the aqueous radiation chemistry of the reactor flow system since the α/7Li dose-rates at the start of the reactor cycle are similar to those for neutron and γ radiation. In order to more accurately predict the Critical Hydrogen Concentration (CHC), the minimum amount of dissolved excess H2 which can suppress water radiolysis, the quantity of H2 and H2O2 produced from this radiolysis source at different temperatures must be measured. Once these values are obtained, current chemical kinetic models can be updated to better match the actual value of the CHC. Recovering uranium from seawater is critical to the future of the nuclear industry, as most of Earth’s currently known uranium resources reside within the oceans. In order to extract this uranium, fabrics radiolytically grafted with uranium-chelating monomers can be used as adsorbents for this metal species. 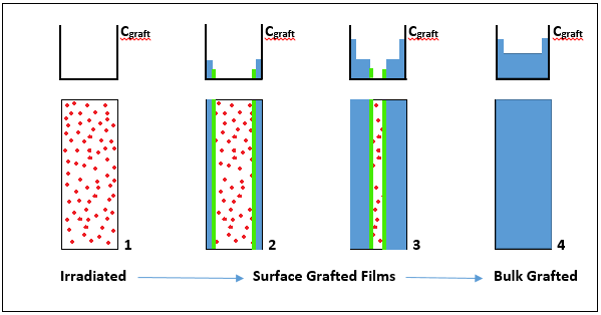 By varying the monomer as well as the dose and dose rate during the grafting process, the uranium loading capacity of the fabric can be maximized. Our group is also focused on reducing the chemical waste resultant from this process by limiting the amount of non-aqueous solvents and non-biodegradable chemicals during the grafting and washing processes respectively. Proton conducting membranes are synthesized using radiation grafting for polymer electrolyte membrane fuel cell (PEMFC) applications. 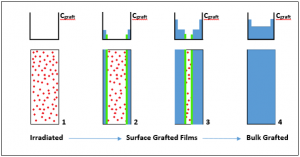 Using direct and indirect grafting methods we graft proton conducting ionic liquids onto thermally and chemically stable substrates fluorocarbons. 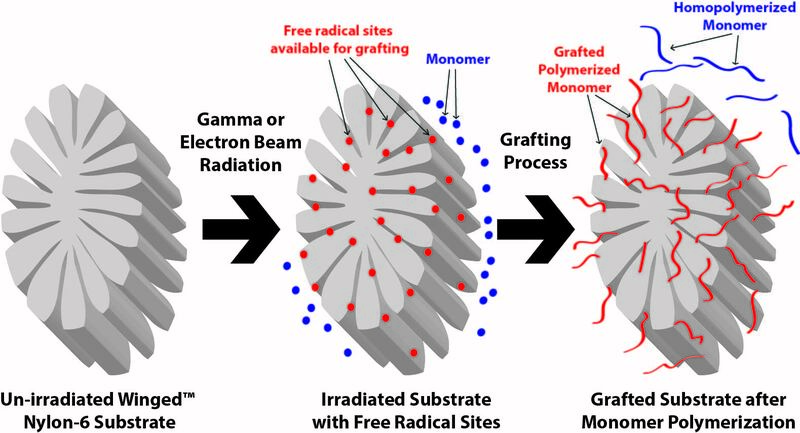 When exposed to radiation fluorocarbon polymers undergo degradation forming radicals that can be used for grafting. We have two main goals for using this method for synthesizing membranes: Increase the operational temperature of PEMFC which significantly impacts their performance and synthesize films without using an acid treatment which can degrade the films and decrease their cycle life. This work investigates the degradation mechanisms involved and establish a probabilistic model to describe the effects of ionizing radiation on crosslinked polyethylene (XLPE) and ethylene propylene rubber (EPR) cable insulators, used in nuclear power plants. Bio-compatible nanomaterials are a class of advanced materials used for drug delivery systems and MRI contrast agents. 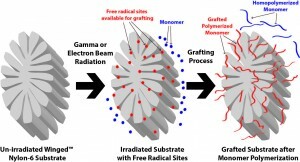 In order to meet stringent criteria for these systems and advance the state-of-the-art methods for their production and characterization, we aim to synthesize the nanogels using ionizing radiation via electron beam from a linear accelerator, thereby eliminating the need for catalysts or additives. 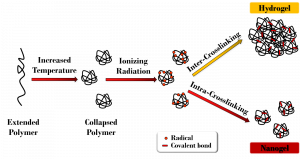 Additionally, metal oxides will be incorporated into selected materials to investigate their capacity to be used for magnetic field-driven targeting and imaging applications. Recommendations for a variety of candidate products will be provided following their characterization so further explorations into their use in drug delivery or medical imaging applications can be performed.